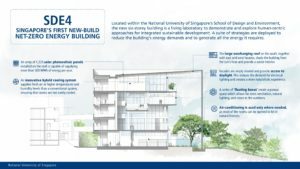 The National University of Singapore (NUS) launched the first new-build net-zero energy building in Singapore yesterday. Mr Heng Swee Keat, Minister for Finance and Chairman of the National Research Foundation, visited the building and officially launched SDE4. The new SDE4 building is energy efficient and environmentally friendly, with a suite of innovative building strategies to improve the comfort and well-being of building users, and is situated within the School of Design and Environment (SDE). The SDE4 is designed to be climate responsive with net-zero energy consumption, the building features a range of sustainable building designs, such as solar roof installations, a hybrid cooling system, as well as approaches to optimise natural ventilation and lighting. The SDE4 building houses a mix of research laboratories, design studios, as well as teaching and common learning spaces over six floors, covering a gross floor area of 8,588 square metres. A large overhanging roof, to shade it from the sun’s heat and provide a cooler interior. It is designed to consume only as much energy as it produces complete with a solar roof top comprising more than 1,200 solar photovoltaic panels to harvest solar energy. It boasts an innovative hybrid cooling system which ensures that rooms would not be overly-cooled. Rooms within the building are supplied with cool air at higher temperatures and humidity levels than a conventional air-conditioning system. Ceiling fans circulate the cool air to generate a comfort condition that is significantly better than overcooled spaces. The building uses ‘floating boxes’, where its shallow plan depth and porous layout allows for cross-ventilation, natural lighting and views to the outdoors. Rooms can also be opened to let in natural breezes. Air-conditioning can be used only where it is needed, reducing the overall electricity usage. “The School will continue to push the boundaries of innovative design as it embarks on the next phase of transforming three other buildings in the precinct to embrace a ‘well and green’ philosophy. 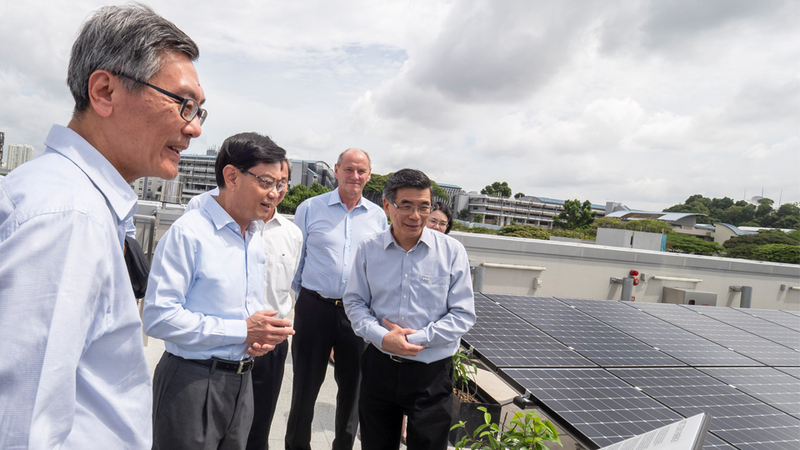 We hope that this novel concept will inspire future high-performance buildings and sustainable development designs in Singapore and beyond,” Professor Tan added. The completion of SDE4 marks the first milestone in realising the School’s vision of creating a ‘well and green’ zone, called the Engineering and Design & Environment precinct, that will be a prototype of human-centric approaches to future sustainable development in NUS. Two existing buildings are currently being renovated. One more building will be redeveloped, and this new building will demonstrate the ambitious goal of being net-positive energy, net-zero water, wellness certified and low carbon construction.